The book behind the minister. Or vice versa? I first read Timothy Keller’s book, The Reason for God, after reading an article on him in Newsweek. I was intrigued by his approach to ministry and his interactive preaching style. Although his theology is a bit more conservative than my own, I think he’s quite a good scholar, and quite good at message conveyance. The Reason for God did not disappoint in either its scholarship or its clarity. Keller’s impetus is to provide for the reader his reasoning for belief in a God, specifically the God known through Christ, and you get an adequate picture of both what his belief is and the pillars that sustain his logic. And I have to say that I found myself nodding more than shaking my head. 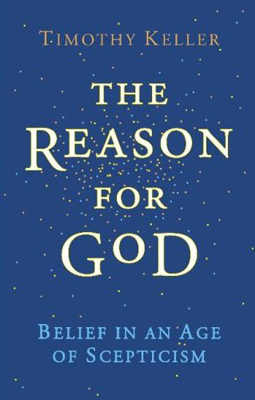 The book is configured into two primary sections: “The Leap of Doubt” and “The Reasons For Faith.” Both are intertwined with narrative and questions that Keller has received over his years of ministry at Redeemer Presbyterian Church (PCA), with Keller providing responses and answers. Actually, I would call them “pseudo-answers,” because, while they appear to answer the question, Keller writes with an overconfidence and overstatement that I just can’t fully stomach. In Keller’s attempt to wrap things up tightly for the reader (and convert the reader, I suspect), he leaves large gaping holes that go unacknowledged. You don’t need to read far in the work to fall into one. Chapter 2, “How Could a Good God Allow Suffering,” is one such example. Although I think Keller is on the edge of some really wonderful thinking on the issue of systemic suffering (his section entitled “Evil and Suffering May Be [If Anything] Evidence for God” deserves a second and third look…despite the appalling title), he ends spouting the same old argument heard before and wished for by anyone who has ever suffered: that the past suffering makes the future joy that much better. I don’t think that’s true. And even if it were, I don’t think it’d be helpful to say. Ever. Really? Decisively? Keller drops the ball here in scholarship, and going against the overwhelming view of modern theologian/historians, claims too much. While it does seem that the author of Mark (conveniently often called “Mark”) is name dropping for a particular reason, we can only speculate why. Perhaps it was because Rufus and Alexander were still around. Or could their insertion be an interpolation? And I completely disagree with his idea that Paul’s letters were meant for public proclamation. I think it is reasonable to believe that Paul expected his Corinthian letter(s) to be read to that church, but can we really claim that to be “public” or that the church that received them would scrutinize them? To me that sounds like a Western mind (Keller’s) trying to put its own lens on Eastern thinking (Paul and the church at Corinth’s). I found his strongest thinking in Chapter 9 where he addresses morality and the knowledge of God. In looking at a number of conventional arguments on the subject, Keller provides a very accessible description of the popular thinking of how morality is found, configured, and reinforced in this world, citing both Annie Dillard and Ronald Dworkin in his formulation. Yet again, he goes too far in answering the question for the reader, instead of just letting the question hang (as, I think, all theological questions should). This book is worth the read if you can take the over-confidence. Keller presents wonderful arguments. But, like with all things, one shouldn’t be totally persuaded. Over-confidence in one’s own arguments can lead to idol worship, and Keller’s conviction of his correct beliefs borders on that. But, then again, I really have yet to find an author on this subject that isn’t over-confident. Including the author of this blog. This entry was posted in Literary Notes by Timothy Brown. Bookmark the permalink. I feel as if I’m called to be a writer. I’m agnostic, and I’m wrestling with whether or not there is a God. I have many faith-related questions, and your blog is filled with wisdom, which I’m assuming you have a lot of. I dunno why, but I felt like letting you know about myself somehow. Your blog is intriguing. Maddy, thanks for your testimony. I wish you much success and much luck on your writing!